Catit Design Senses Speed Circuit for Cats is designed to engage with your cats incredibly heightened sense of sight, sound and touch. 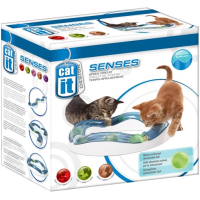 This exciting product entices, engages and entertains your cat as the motion activated illuminated ball moves at high speed around the circuit. The Catit Design Speed Circuit for Cats invites your cat to chase and swat the ball for exciting day or night time play.